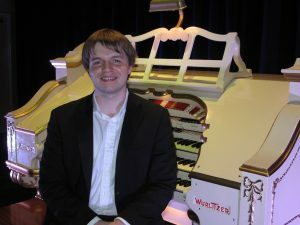 David was born in 1990 and has being playing the theatre organ for ten years. Word of his skills has already spread beyond these shores as last summer he was invited to play for the American Theatre Organ Society annual convention in Alabama. David is in his first year on the postgraduate MA course at the Royal Academy of Music, London. He also undertook his bachelor’s degree at the Academy for which he received a first class honours, and has received full scholarships for both of these degrees. Since 2008 his professor has been Hamish Milne, and in his final year of undergraduate in 2013 he received the highest grade in the piano department at the Royal Academy of Music, earning him the Leslie England Memorial Prize and the Walter Macfarren Gold Medal. David says that he relaxes by playing the Theatre Pipe Organ and has become well known for playing his celebrated organ transcription of “A Night on Bald Mountain” by Mussorgsky.